This figure was made from a Naboo Obi-Wan. I cut off his left arm at the bend. Then I dremmelled out a socket in both sections of them. Then I glued in the arm articulation from Final Duel Obi-Wan. Once the glue dried I snapped the two pieces of the arm together. I also cut off the left hand and dremmelled out the cuff of Obi-Wan's robe. I cut off the forearm of Final Duel Obi-Wan and glued it into the cuff socket of Naboo Obi-Wan. 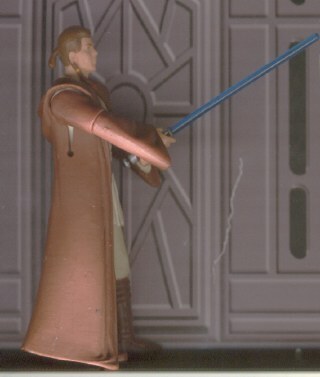 Now, I have an Obi-Wan with his robe on that can hold his saber with both hands.